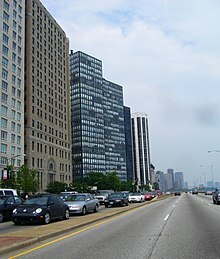 860–880 Lake Shore Drive is a twin pair of glass-and-steel apartment towers on N. Lake Shore Drive along Lake Michigan in the Streeterville neighborhood of Chicago, Illinois. Construction began in 1949 and the project was completed in 1951. 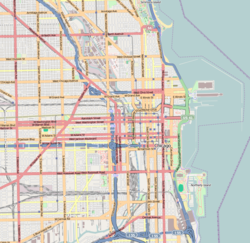 The towers were added to the National Register of Historic Places on August 28, 1980, and were designated as Chicago Landmarks on June 10, 1996. The 26 floor, 254 ft (82 m) tall towers were designed by the architect Ludwig Mies van der Rohe, and dubbed the "Glass House" apartments. Construction was by the Chicago real estate developer Herbert Greenwald, and the Sumner S. Sollitt Company. 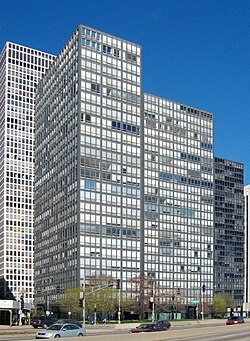 The design principles, first expressed in the 1921 Friedrichstrasse Skyscraper competition in Berlin and built thirty years later in 860–880 Lake Shore Drive, were copied extensively and are now considered characteristic of the modern International Style as well as essential for the development of modern High-tech architecture. The towers were not entirely admired at the time they were built, yet they went on to be the prototype for steel and glass skyscrapers worldwide. Initially, it was difficult to acquire financing for the project, turned down by lenders like Baird & Warner, who considered the design scheme to be too extreme. 860–880 Lake Shore Drive Apartments embody a Modernistic tone with their verticality, grids of steel and glass curtain walls (a hallmark of Mies' skyscrapers), and complete lack of ornamentation. Tenants had to accept the neutral gray curtains that were uniform throughout the buildings;no other curtains or blinds were permitted lest they mar the external appearance. Since Mies was a master of minimalist composition, his principle was "less is more" as it is demonstrated in his self-proclaimed "skin and bones" architecture. 860-880 Lake Shore Drive (left) has windows attached to structure, not to mullions; Esplanade Apartments at 900-910 Lake Shore Drive (right) were first true curtain-wall high-rises. This building, like many of his Chicago high-rise structures, causes controversy in the pure minimalist community due to its mullions. 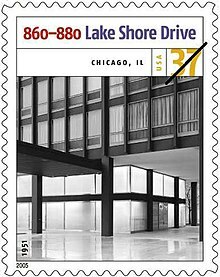 Mies is hailed as the father of "less is more"; however, 860–880 Lake Shore Drive is covered in non-functional I-beam mullions. Mies explains how the mullions do not violate his less is more philosophy in a 1960 interview: "To me structure is something like logic. It is the best way to do things and express them". The mullions on his buildings reflect the inner structure and therefore give truth to the aesthetic of the building. The idea of truth in architecture aligns with the aesthetic and principles of the international style as taught at the Bauhaus. Although the 860-880 buildings were the first high-rises to look like they were sheathed with a curtain wall, they in fact were not, because the windows were attached to the structure, not to the decorative-only mullions. It was Mies van der Rohe's Esplanade Apartments just to the north (900-910 Lake Shore Drive) that were the first high-rises to actually have an uninterrupted glass/aluminum curtain wall. Krueck and Sexton Architects of Chicago were commissioned to renovate the historical towers. Teaming up with them were the preservation architects, Harboe Architects along with forensic and structural analysis firm, Wiss, Janney, Elstner Associates, Inc. This team was directed to fix prior renovations done to the buildings. The preceding renovations took away from the historical accuracy of the towers. Architects were assigned to restore the distorted lighting scheme with original translucent glass, replace the deteriorating travertine plaza, which connects the two towers, and exchange for stones with more historical precision. The buildings were finished in 1951 and were featured in a 1957 article in Life Magazine on Mies. 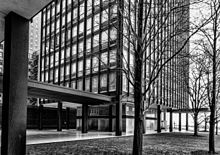 In 1996 they became the first buildings designed by Mies van der Rohe to receive Chicago Landmark Status. The glass towers have been on the National Register of Historic Places since 1980. In June 2005, the United States Postal Service included the towers in the commemorative stamp program, Masterworks of Modern Architecture, wherein they were listed as one of the "12 outstanding examples of modern buildings". In celebration of the 2018 Illinois Bicentennial, 860-880 Lake Shore Drive was selected as one of the Illinois 200 Great Places  by the American Institute of Architects Illinois component (AIA Illinois). The twin towers are 26 stories high. The buildings are 46 feet apart. The steel skeletal frames rest on a 21-foot grid and are uniform in their design. The building was originally designed for 860 to contain 90 three bedroom apartments and 880 to hold 158 one bedroom apartments. Many of the units have been combined to enlarge living spaces. Residents are zoned to Chicago Public Schools. Residents are zoned to Ogden School and Wells Community Academy High School. ^ "860–880 Lake Shore Drive". City of Chicago Department of Planning and Development, Landmarks Division. 2003. Archived from the original on 3 May 2007. Retrieved 2007-05-14. ^ GmbH, Emporis. "860 Lake Shore Drive, Chicago - 116852 - EMPORIS". www.emporis.com. ^ Handley, John. "Looking Forward-Is Chicago shifting into a modern mode?" Chicago Tribune 2 June 2002: Real Estate 1. ^ ALDEN WHITMAN (August 19, 1969). "Mies van der Rohe Dies at 83; Leader of Modern Architecture". The New York Times. Retrieved July 9, 2014. ^ "Mies and the Mastodon." New Republic 6 August 2001: 25–30. ^ Puente, Moises. "Conversations With Mies" p31. New York, Princeton Architectural Press, 2008. ^ "Moderisms's siren song, restored". AIArchitect. 2008. Retrieved 2008-03-27. ^ "Emergence of a Master Architect". LIFE Magazine. 1957. Retrieved 2017-03-29. ^ "The 2008 Commemorative Stamp Program". USPS. 2004. Archived from the original on 2008-03-25. Retrieved 2008-03-27. ^ "Mies on Lake Shore Drive". ArchitectureWeekdate. 2004. Archived from the original on 4 March 2008. Retrieved 2008-03-27. ^ "Geographic Information Systems Archived 2008-11-06 at the Wayback Machine." Chicago Public Schools. Retrieved on September 17, 2009. ^ "Near North/West/Central Elementary Schools Archived 2009-06-12 at the Wayback Machine." Chicago Public Schools. Retrieved on September 17, 2009. ^ "West/Central/South High Schools Archived 2015-05-24 at WebCite." Chicago Public Schools. Retrieved on September 17, 2009.